Click the button to see weaving pictures. 4-Shaft weaving for beginners. Students will learn the entire weaving process using our Design Center looms,** New weavers are introduced immediately to our textile designer wall of fiber and choose their own colors and textures in the first session. This is a comprehensive class that includes project planning and step by step loom dressing and weaving. New weavers will come away from class with one completed project of their own design, together with an inspiring sampler of different fiber types and weave structures such as: basket weave, rib weave and a variety of twills. Weaver's first project is a choice of either a neck scarf or a table runner. 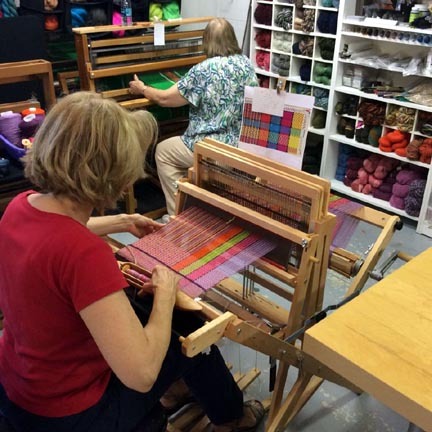 All materials and use of studio weaving looms include via the class fee. This class meets 4 days in a row. For: First Time Knitters or ReFreshers. With these basics, knitters will be able to knit Scarves, Shawls, Pillow Covers, Baby Blankets, Wash Cloths, Bags and more. Students Choose one of our knitting yarns for class, either Merino CHUNKY (5 color choices in class) for a chunky neck warmer cowl or scarflet or Cotton CHENILLE (3 color choices in class) for a cozy scarflet or two soft face cloths. Knitting needles will be on loan during class time & may be purchased separately at the end of class. Projects will be started in class to be completed at home. 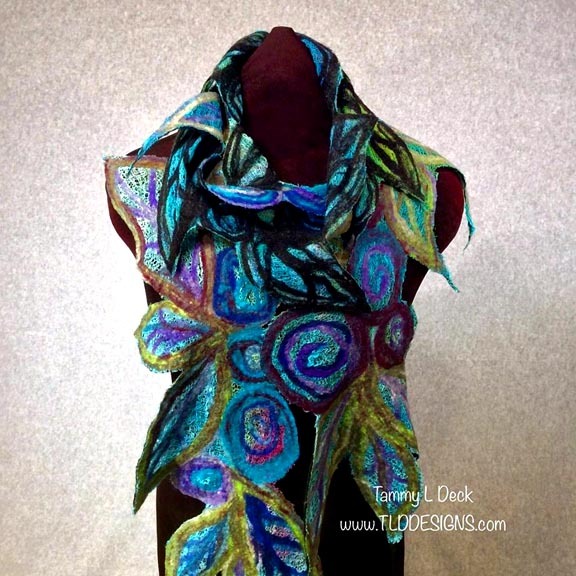 Learn basic sewing skills needed for fashion, fiber art & textile design projects. Learn how to sew straight seams, corners and curves, french seams, hemmed edge and hand closure. Students will sew a "Bending Log Cabin" piecework pillow and (if time allows) a squared bottom tote bag during this beginner session. Use of Sewing machines & accessories, Fabric and stuffing for pillow, fabric for tote bag are all included with class fee. Students need not bring anything to class. Campers are introduced to the basics of glass bead making during this 4 session day camp. Torch safety will be taught and reinforced as campers are introduced to Basic skills through demonstrations and hands on practice with each camper working at a dedicated torch station. Skill Summary: basic bead making, using multiple colors, pulling stringers, applying lines and dots, shaping, removal & cleaning (dressing). We work with Italian glass rods which come in a fabulous range of colors. Students will each create a multitude of beads to keep. General safety guidelines and suggestions for home spaces will be discussed. Ages 17 and up. (Age 14 to 16 allowed when a guardian is registered and attending / register 2 people at the shopping basket) We do require a signed release for all students regardless of age (minors require legal guardian signed release in advance of start date) Maximum of 6 campers allows for individualized attention. Fee: $195 includes rental torch station (only 3 available) glass, gas and supplies. Fee: $285 includes torch station to keep, glass, gas and supplies. 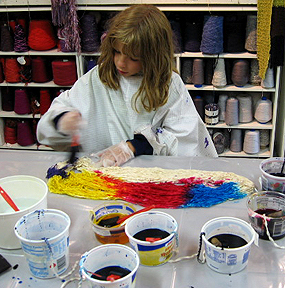 Campers will learn the entire weaving process while creating their own hand painted cozy scarf during this 4-day session. They will measure and hand paint the warp with dye on the first day (please dress camper in old clothes). Day two (please dress camper in old clothes), they will rinse their warps and hang them to dry while they learn about felt making and make an envelpe clutch or shoulder bag. Day three will be spent setting up a rigid heddle loom progressing to the start of weaving. Day four they will complete the weaving, remove it from the loom and finish their scarf by hand knotting the fringe. Campers should bring a sack lunch each day (we have a small fridge and micro). Campers complete 2 artsy one of a kind projects to keep. 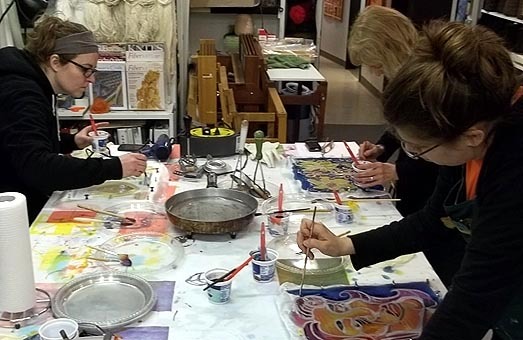 Your camper(s) will get 4 great days of creative exploration and variety in textile artistry and design. Each project is packed with problem solving skills and design choices as they are guided and encouraged by a professional fiber artist. Grown-ups are welcome to sign-up with their kiddos, too..... this camp appeals to all ages! On Tuesday campers will rinse their hand dyed yarn from the previous day and hang it to dry. 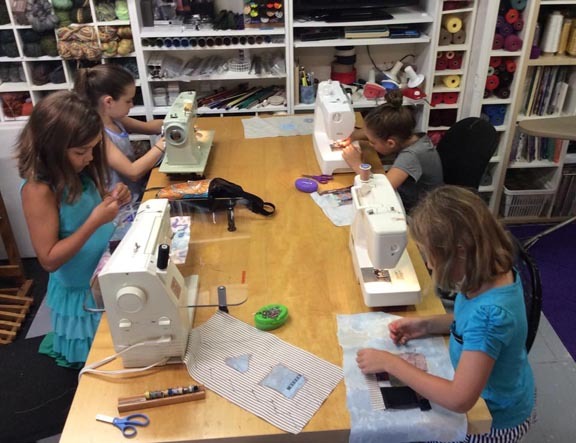 Campers will then proceed to learn about hand weaving and will work on studio prepared looms and get right to the fun of real weaving to create colorful "Thrumori" textiles rich with texture and sparkle. Wednesday, campers will remove their woven fabric and finish the piece to their vision when provided with options such as: wall hanging, cell phone sleeve or purse, doll blanket or ???? Campers will then be taught how to hand knit and once they have the hang of it.... grab their hand painted yarn from Monday convert it into a ball and get started on their one of a kind knitting project. Finally on Thursday, campers will learn how to set-up and use a bead-weaving loom, design and weave their own beaded bracelet they can proudly wear home from camp. Any remaining time this day may be spent finishing work on their hand woven or knitting projects. All equipment and materials will be provided. Ages 10 through... grown-ups. Campers should wear old clothes to camp Monday & Tuesday. Additionally, campers should bring a sack lunch each day for our mid-day break (we have a small fridge and micro). 4 Shaft weaving for beginners. Students will learn the entire weaving process. Using our Design Center looms,** learn how to plan and measure your warp, sley the reed and dress the loom. You will complete your project and sample different weave structures. You can choose to weave a scarf or a table runner. Ages 10 and up. This class meets 3 days in a row. 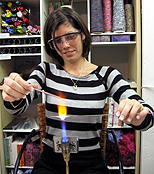 Each day "campers" will introduced to techniques utilized by "warm" glass artists & designers. Monday and Tuesday will be all about flame working and students will experience the same skill normally covered in our single day class. 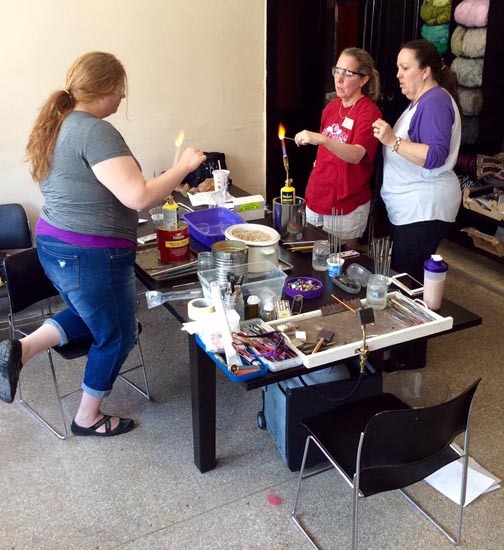 Wednesday and Thursday will be focused on kiln formed glass work and cover glass cutting, layering and kiln controls and include the same skills covered in our single session intro class. All materials and tool rental included in our class fee. Students should wear all cotton clothing and comfortable, close toed shoes for periods of standing during lampwork portion. A signed release will be required of each student prior the start of class. A great process class for those just starting out and are ready to experiment with a variety of dyeing, painting, printing, and stamping techniques. This is a fun, fast paced class. Students will work on a variety of sample fabrics including cotton, rayon, silk and rayon/silk velvet. Learn various ways to use professional Dyes from thickened for printing to liquid and vat dyeing. During the final class students will apply 1 or more of the techniques to a silk scarf to keep. This is a special offering as a 4 day summer intensive ( 4 days in a row). Students should bring rubber gloves, a plastic grocery bag, and 5ea pieces of 24" square plastic to the first 3 classes (re-use each day). Dyes and silk scarf will be provided. Wear old clothes to class. Click the button to see felting pictures. 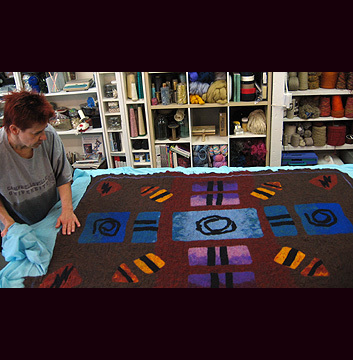 Each student will design and make their own felted area rug/wall tapestry during this 3 day workshop. On Day one, students will design their rugs and create pre-felts to cut out their design elements and then go on to begin to layout the project. On day two the final layout, layering of wool will be completed. On day three the rugs will be wetted, sanded, rolled, felted stomped on, pounded and fulled to a finished piece. Weather permitting, we will be working outside in the afternoon of day 1 and 3, so please dress comfortably, bring sunscreen and plenty of liquid refreshments. Prior experience in felt making is needed so please consider taking our Tapestry Felt and/or Beginner's Purse class(es) prior to this workshop. NO KNITTING, CROCHETING are used during this process!! There's only space for 3 people... please register asap. We also need to discuss design ideas and colors so your 3 pounds of wool may be ordered and available in time for class. Students will be introduced to basic, flat, wet-felting skills including strategies and control methods for imbedded surface design and uniform distribution of fibers. Considered painting and drawing with fibers. Three finished works expected from the 4 day immersion. Class size is limited to 4 due to the layout scale of the third piece. Balance due must be paid 15 days prior to start date or your seat and all money on deposit will be forfeited. NO refunds, credits or transfers available if you fail to pay the balance when due. 100% of your payment may be held in credit and transferred to another class when you notify us 15 days or more prior to the start date of your class. 80% of your money refunded with 21 days request. 50% of your money refunded 15 to 20 days request. No transfers, credits, make-up sessions or refunds available for missed sessions. Doctor's letter will be considered for TLD Class Credit.